Looking after a puppy is no different than looking after a baby. They sleep a lot, poop a lot, and require constant attention. One of the most pressing issues that face new dog parents is what to do and how often to feed their pup. When determining what the best for your dog is, size is an important factor to consider. What is best for small breeds is not the same as large breeds. A ‘large’ dog weighs from 25 kilos (55 pounds) by two years of age. 1 How Much is Safe for my Large Breed Puppy? 2.2 How Much Should I be Feeding my Large Breed Puppy? How Much is Safe for my Large Breed Puppy? Just like with humans, bigger isn’t always better for canines. Dogs need to be in their optimal weight zone. To achieve this, they need to be fed a healthy diet, and exercised regularly. A lot of large breed dogs are genetically predisposed to put on weight fast. First time dog parents often think fast growth in their pup is a good thing, and encourage this growth by fueling their pup with a high calorie, high protein diet. On the contrary, slow, gradually growth is best for dogs, especially large breeds, and there are many excellent large breed puppy food brands that will assist you. The bones and joints take time to grow and forge correctly. Rapid growth can cause arthritis, hip dysplasia and knee joint problems later in life. This will be painful for your dog, and expensive for you. Your dog’s skeleton isn’t fully developed until your dog is two years old. The more weight that is placed on malleable, growing bones, the higher the chance of stress fractures in your puppy will be. The ideal weight for a dog isn't a number on a scale. It can be done at home simply by feeling around your dog’s middle. You should be able to feel your dog’s ribs and spine, but not easily be able to see them poking through their skin. They should be able to hold their body weight up with ease, and their stomachs should not protrude to the floor. Large and giant puppies grow faster than their smaller counterparts, and they stay at the puppy stage for longer than small dogs too. Some dog breeds (such as Labradors and Great Danes) can increase in size between 60-80% in their first year. That puts a lot of stress on fragile bones. Such body changes also leads to nutritional imbalances in dogs as the body is working in overdrive to produce enough energy, nutrients and minerals to compensate for rapid growth. There are quite a few excellent puppy food options for large breed dogs. The challenge comes with finding the brand that agrees with your puppy the best as far as digestion and taste. Here are 5 top choices that have proven to hit the sweet spot for owners and pups alike. With Purina’s Pro Plan Focus blend, you know that your large breed dog is getting the nutrition that he or she needs at any age. First off, you’re getting real chicken as your first ingredient, meaning that this dog food is guaranteed to be rich in protein, as well as fish oil rich in omega-3 fatty acids, perfect for improving your dog’s vision. Combine that with the complex carbohydrates and prebiotic fiber, and you’ve got a dry dog food that not only keeps your four legged friend healthy, but keeps them full all day long. In addition, this formula is perfect for picky eaters as well; even dogs with sensitive stomachs or allergies can still eat this blend without any problem. If you’ve got a dog that is having trouble keeping food down, you would be hard-pressed to find a dry food blend that is this affordable, this effective, and comes from such a reliable brand as Purina. Check out our full review of the top Purina large breed choices. Perfect for your large-breed dog at any age, Wellness Complete has put a lot of science into this dry dog food blend. What you’re getting is solid protein from whitefish, chicken, and salmon, complex carbohydrates from oats, and a healthy vegetable medley of tomatoes, carrots, spinach, apples, blueberries, and a host of other natural ingredients, without artificial flavorings or preservatives. Of course, Wellness Complete has gone beyond just making sure your dog has all the nutrients that he or she needs; thanks to their confirmation studies, all the nutrients that are in this dry food blend are getting to your dog where he or she needs them the most. Combined with a healthy dose of prebiotics and probiotics for improved digestion, as well as antioxidants and a diet balanced specifically for large-breed dogs, and and this is the perfect dry food for anybody who wants to give their furry friend the very best nutrition. We've listed other Wellness large breed brands in our write-up here. If you’re looking for a brand of dog food that has stood the test of time, Hill’s Science Diet is right up your alley. They bring their seventy years of research and development into this large-breed dry puppy food blend, giving you a balanced mix of easily digestible carbs, fatty acids, and rich, full protein, along with balanced nutrients and multivitamins to keep your puppy growing strong and healthy. The end result is a dry food that tastes good to your dog, and still provides them with exactly the right amount of what they need to keep growing. With their large and well-trained research staff, it’s no wonder why both veterinarians and animal shelters trust it to their pets. If your large-breed puppy is having digestive problems, or you simply want to make sure they’re getting the best diet they can, then you should start them off right with Science Diet, which you can also learn more about in our dedicated review. Priding themselves on healthy ingredients with real chicken before anything else, it’s safe to say that Blue Buffalo is a company that’s certainly looking out for your four-legged friend. If you were to keep reading the ingredients, you’d find even more things for you and your dog to love, like whole ground grains, peas, carrots, blueberries, and even pomegranate to keep your puppy growing up strong. Not only does Blue Buffalo give your dog fresh ingredients made small for puppy’s jaws, but they also add their own special blend of Lifesource bits. These wonderful little cold- processed bits are designed by animal nutritionists to make sure that your dog can have an improved immunity system, better lean muscle growth, and a healthy coat. With a strong commitment to fresh ingredients and healthy pups, you can easily trust Blue Buffalo Large Breed Puppy Dry Food to all of your little large-breed pups and ensure they grow up both healthy and happy. 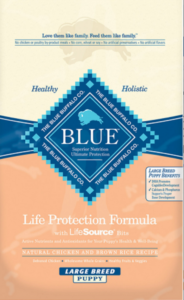 Find out more about why we like Blue Buffalo so much. 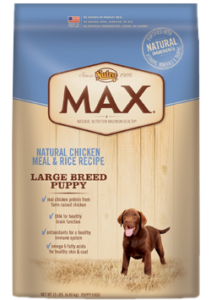 If you’re looking for a solid first kibble for your new large-breed pup, Nutro Max has you covered with a complete setup. Made entirely in the USA with high-quality farm-raised chicken as the first ingredient followed closely by whole grain rice and fish oil, this is a wonderfully complete mix of fulfilling nutrition with a flavor your puppy will love. In addition, this puppy blend has extra nutrients specifically designed for larger breeds, as well as ingredients for dental health, a strong immune system, and the healthy growth of lean muscle that is so important in your dog’s early years. Of course, what isn’t in this blend is just as important; Nutro Max blends have no artificial colorings, flavorings, or preservatives, so your puppy only tastes real ingredients. 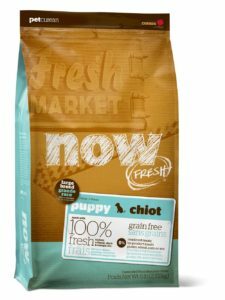 At such an affordable price, this is a great dry puppy blend for anybody with a new member of the family, or even a whole litter of them, to give them the food they need to grow strong and healthy. Read more about this Nutro option inside this full review. Does my Dog Need Extra Calcium? Some people get into the trap of feeding their puppies ‘calcium enriched’ puppy food or even calcium tablets thinking this will benefit skeletal development. This can in fact have the opposite effect. A puppy’s digestive system is not developed enough to regulate the correct amount of calcium for their growing bodies. Rather, it releases all the calcium into their system giving their growing bones more calcium then it knows what to do with. This can lead to over development of bones and this can cause a multitude of problems later in life. The Association of American Feed Control Officials (AAFCO) has noted that the best puppy food should have no less than 37 different nutrients. Standards now make it easy to spot what products are better, as the ones who meet these standards have it duly noted on their packaging. Many pet parents get sucked into purchasing giant puppy specific kibble and wet dog food. These formulas generally have higher calorie content than adult dog food to help encourage growth. There is no need to purchase these formulas as speed growth is dangerous. Many find themselves wondering what the best large breed puppy food is? Should they go for a wet or dry diet? A combination of the two is ideal. Different nutrients are found in different varieties of large breed puppy food. It is important to include kibble in a healthy large breed dog diet, as this helps keep puppy’s teeth strong. Many dog owners are passionate about the particular brand of dog food they use and will argue that their dog food is the premier choice for large breed puppy food. Nutro Natural Choice is one such brand, according to repeated large breed puppy food reviews. Advertised to be made from all natural ingredients, this brand contains 10 varieties of dog food that meets the AAFCO recommendations. On its packaging it also has a breakdown of the nutrients and minerals found in its contents. They also have a wheat free option, which is great for dogs that may suffer from skin and/or intestinal illnesses. Hill’s Science Puppy Food is another well-known and well-loved puppy food. It has traces of flaxseed oil and fish oils provide puppy with nutrients that will have him bright eyed and help maintain a healthy coat. Many have criticized Hill’s Science’s use of beetroot pulp as something cheap to bulk the product up. But the company, as well as their devotees, claim that this pulp actually provides intestinal benefits and helps regulate blood sugar levels. Blue Buffalo has grain free chicken recipe for your giant pups that are top of the line in quality and nutrition. How Much Should I be Feeding my Large Breed Puppy? 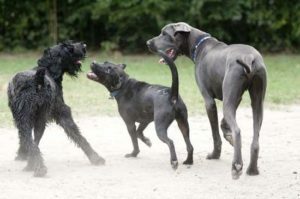 The amount and frequency of feeding your large or giant puppy depends on the age, breed and activity level of your dog. The younger the dog, the more they will eat for their weight. Puppies under six months old will require feeding three-four times per day. After six months, whittle this amount down over the following six months until your dog requires feeding in the morning and evening only. Not all ailments are nutrient based problems, however. Some breeds are genetically predisposed to problems such as hip dysplasia. Some small breeds of dogs also are at genetic risk of this problem too. Puppies do not have the self-control to only eat when they need to, a skill that comes later in their life. So ‘open feeding’, where a full bowl of kibble is available for pup to graze on as they feel fit is not recommended. Studies have shown that large breed dogs such as Great Danes and Labradors benefit from restricted calorie diets, and demonstrated less hip and knee problems in later life compared to dogs of the same age who were on ‘open feeding’ diets. No two dogs are alike. What works for one, isn’t necessarily going to work for another. When welcoming a large breed puppy into your home, it is best to speak to your veterinarian as to what they recommend for your pup. Many are now turning away from commercial large breed puppy food in favor of cooking and creating their own best puppy food, but that comes with time and patience when it's very easy to find suitable ones online. Whatever course of action you take, remember that your new puppy is learning as well as you, so try to make meal times an enjoyable time for pup, in that way, no matter what you feed them, in their eyes it will always be the best large breed puppy food. As we move forward, continue checking back for the latest large breed puppy food reviews.